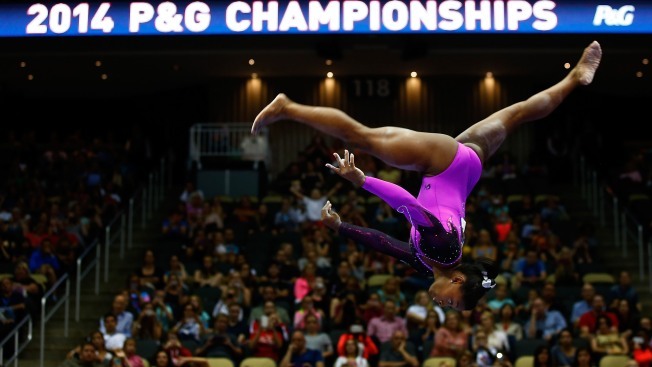 Simone Biles competes on the balance beam in the senior women finals during the 2014 P&G Gymnastics Championships at Consol Energy Center on August 23, 2014 in Pittsburgh, Pennsylvania. Simone Biles easily captured her second straight U.S. women's gymnastics national title on Saturday night, setting the stage for an even bigger title defense in China this fall. The 17-year-old from Texas posted a two-day total of 122.550, more than four points clear of Kyla Ross. Biles did little to tamp down expectations as she takes aim at another world title in October. She entered the night with a sizable lead over the small field and poured it on. Biles posted the highest scores on floor exercise and vault and the second-highest on balance beam during a meet that felt more like a coronation. Ross, the lone member of the 2012 gold medal-winning U.S. Olympic team currently in competition, recovered from a tough first day to finish runner-up to Biles for the second straight year. Maggie Nichols was third, followed by Alyssa Baumann and MyKayla Skinner. U.S. women's team coordinator Martha Karolyi will have some interesting decisions to make over the next month as she tries to fill out the five-woman roster to send to China for worlds. Figuring out what to do about Biles won't be one of them. The chatty, charismatic teenager has eagerly accepted the mantle as the next star in a line of medal-hogging Americans that stretches back a decade, from Olympic champions Carly Patterson to Nastia Liukin to Gabby Douglas. Two long years remain until Biles can take her aggressively simple gymnastics to her sport's biggest stage. Staying at the top for another 24 months in a discipline where the end of your prime is one misstep away will be difficult. Yet there is an ease to the way Biles performs that has even those who will try to track her down by 2016 take notice. Three-time Olympic medalist Aly Raisman, in the beginning stages of a comeback, called Biles "better than amazing" hours before Biles blew away the field. Biles wasn't quite perfect as her dynamic set on Thursday. Then again, perfection was hardly required. She started Saturday night with a floor exercise that mixes an innocent smile and elegant dance moves with a series of all-business tumbling runs that resemble a series of small explosions. 3-Year-Old Boy With 1 Arm Is Golf Prodigy, Brings "Grown Men to Tears"
She's so dominant on vault she almost looks bored after she finishes her Amanar — which packs 2.5 twists inside a split second and serves as the current dividing line between good and great in the event. By the time she landed her lead had grown to more than five points, the equivalent of a five-touchdown lead heading into the fourth quarter. There would be no miracle comeback, though Ross provided a reminder of why she's perhaps the best gymnast in the world not named Biles. Ross stumbled on Thursday, falling once on floor exercise and uneven bars. She called it one of the most frustrating nights of her career. It didn't stick with her. Barely 48 hours later, she was the serene yin to Biles' electric yang. Elegant on bars, silky on beam her score of 60.350 on Saturday was only .400 behind the total posted by Biles. Then again, after seven near flawless routines Biles didn't exactly finish with a flourish. She hopped off halfway through her beam set, drawing an "ooh" from the crowd and a somewhat sheepish grin. When she landed her dismount Biles peeked over at coach Amy Boorman with a knowing look before the two embraced. Not that it mattered. The miscue simply gives Biles and Boorman something to work on over the next six weeks as she tries to become the first gymnast since Russia's Svetlana Khorkina in 2001 and 2003 to win consecutive world all-around championships.